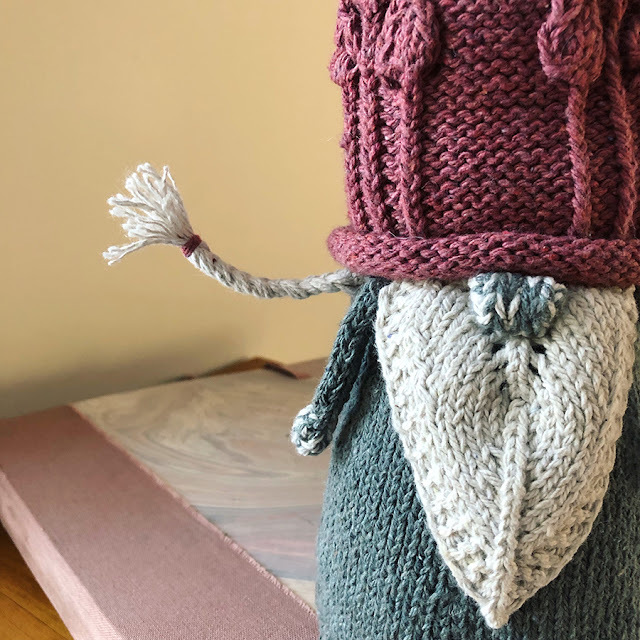 I don't really have aspirations to be a knitwear designer, although I will admit to having tons of ideas lodged in my brain. I just really enjoy the process of knitting from a pattern and adding my own personal modifications. I know I'm good at that. Designing? Hmm. First off, I have a problem with bothering to make sizes for other people, cuz I'm selfish like that. Second... you know that moment when you are following a pattern and suddenly you know you have to tweak it? Do the math? Take a gamble? Go back a ton of rows and fix it? That's the moment I usually put down my work and go do something else. And wouldn't you know? 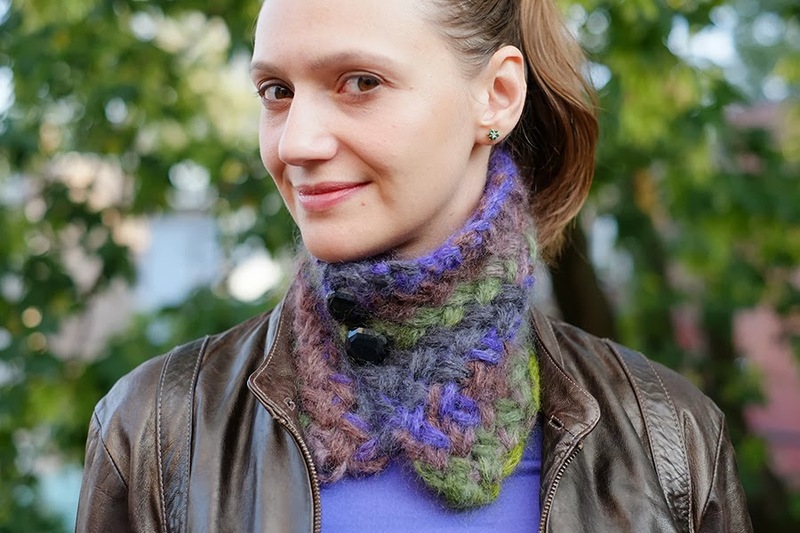 My Wickery Cowl won! 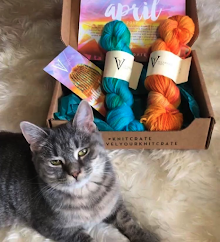 The competition details: Design something that would use only ONE SKEIN of two new yarns launched this fall: Rowan Kidsilk Amore and Amore Shimmer. This kid mohair / silk blend is basically the super-bulky i-cord big brother of Rowan Kidsilk Stripe. 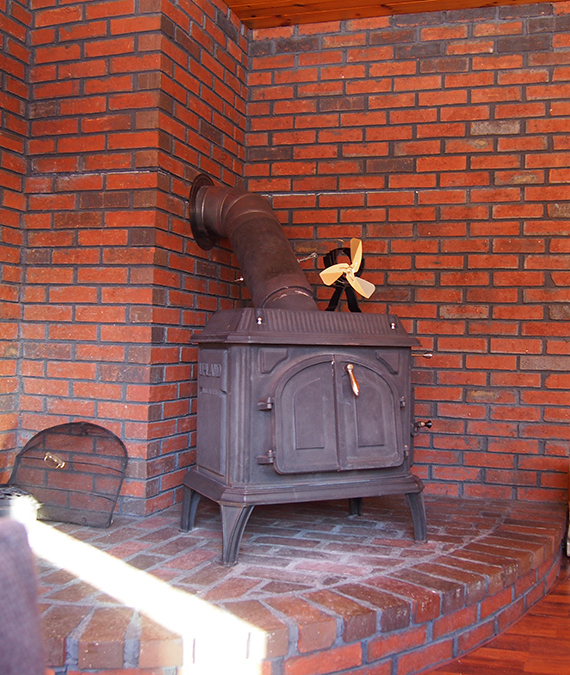 It is incredibly light and lofty, yet surprisingly warm. This was quite a challenge... why? These balls are probably some of the shortest yardage you'll ever find! 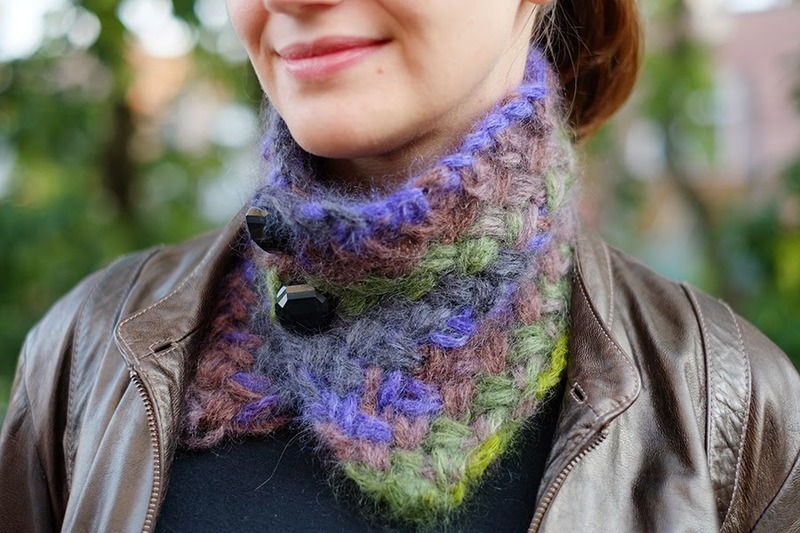 My idea for the cowl was to 1) find a length that would show off the self-striping quality of the yarn, and 2) use a stitch pattern that would make this light-weight yarn firm enough to stand against the neck. Because the stitch pattern is pretty tight, you do need really wonking-big needles... US 35 (19mm)! The two buttons can be placed near the edge, or further in if you want a tighter fit around the neck. You can decide if you like the cowl to be very upright with your buttoning, or you can button it in a way that makes a nice lapelled collar. It's obviously a very simple piece, but I find myself slipping it on all the time. The yarn is so warm (I can't emphasize this enough), that I really appreciate easily unbuttoning it if I get too hot. I really hate unrolling scarves and messing up my hair to pull cowls over my head during an overly-heated bus moment. If you are using a less bulky yarn or smaller needles, you should cast-on more stitches, in multiples of two. 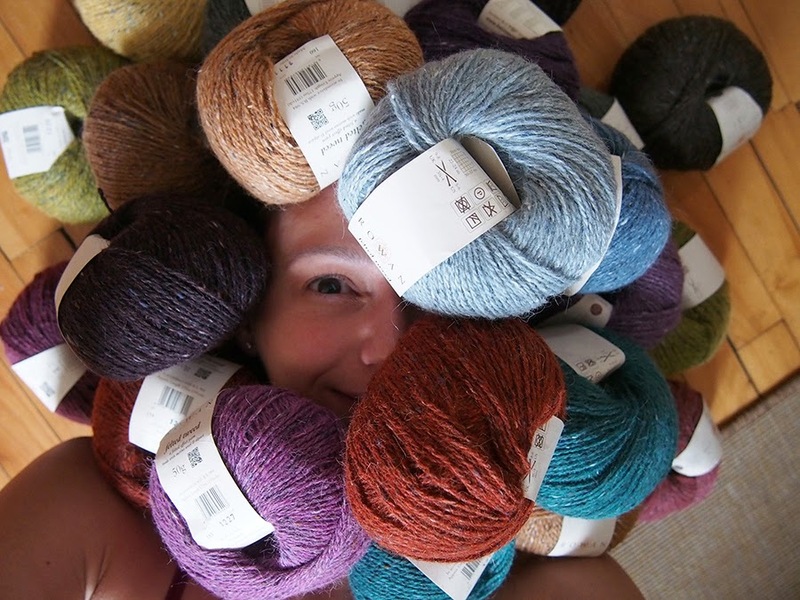 Check out these projects on Ravelry for suggestions. The cowl takes so little time to make, you might just want to 'swatch' the whole cowl and then decide how much you would like to add. 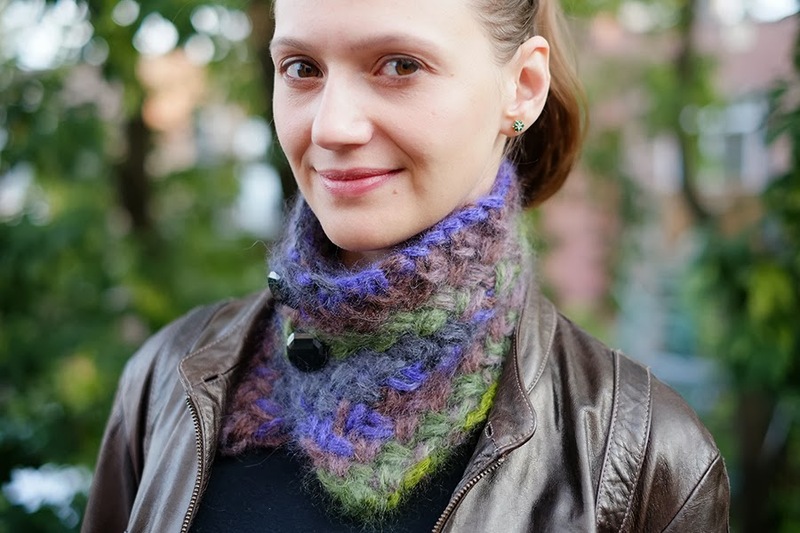 If you like, add 4 buttons so that you can decide how you'd like to wear your cowl, based on your coat or outfit. 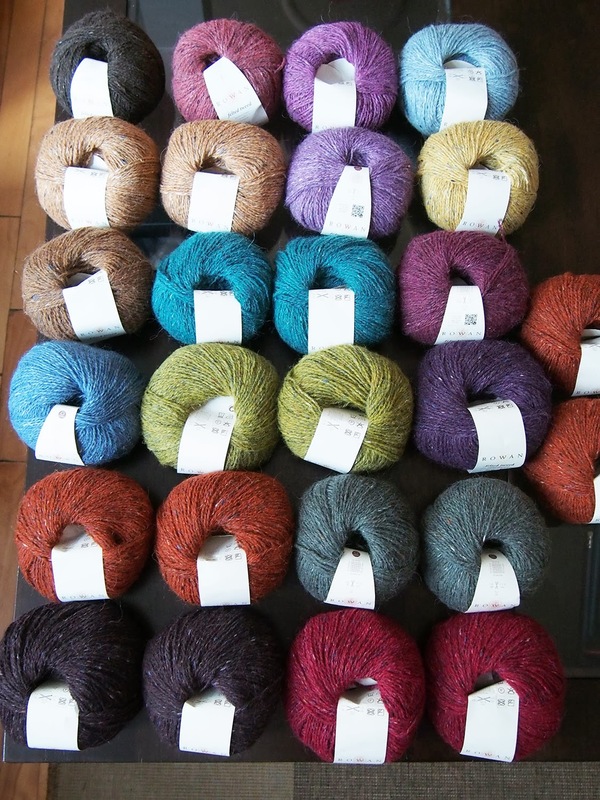 Use plastic or light-weight buttons as the yarn is really very loose and can be easily weighed down. 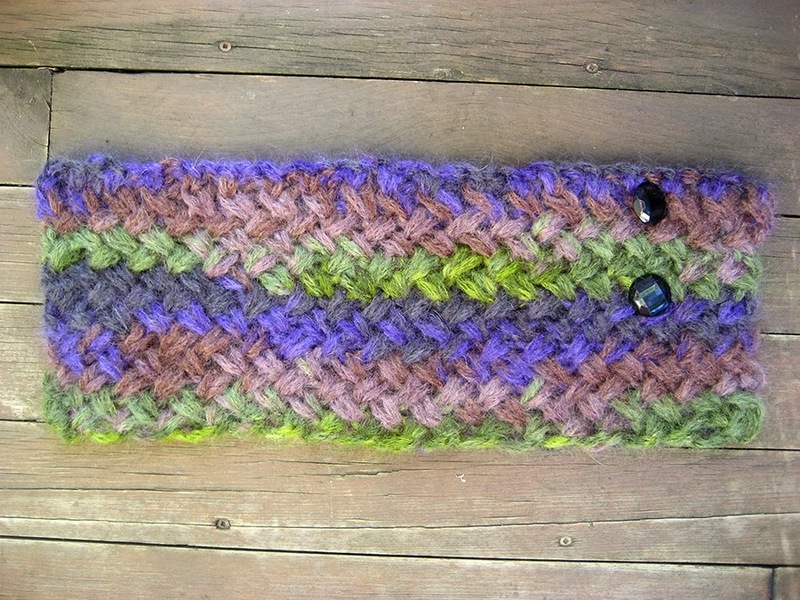 This stitch pattern would be wonderful in a long ring cowl... if you make one, please show me! I must say that the other entries for this contest were wonderful! 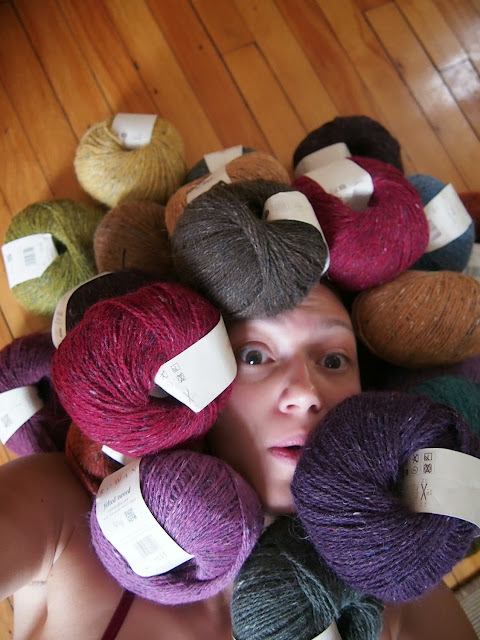 Rowan thought so too, and has released a free e-book containing 9 one-skein patterns by 6 other Rowan Ambassadors. **As of Fall 2015, this collection is no longer available. 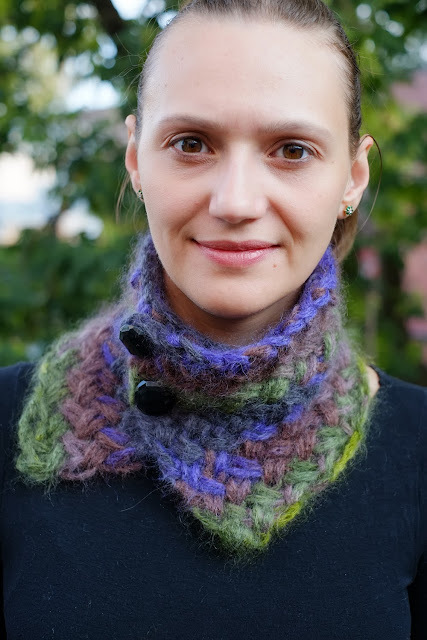 However, you can download my free Wickery Cowl pattern here. You may be wondering what I won as a prize for this little contest. Oh man, it is totally totally awesome. The prize was all the yarn to make any one project from any of the Rowan Autumn/Winter 2013 publications. Well! You may know me well enough to know that I picked the most complicated colorwork piece I could find! 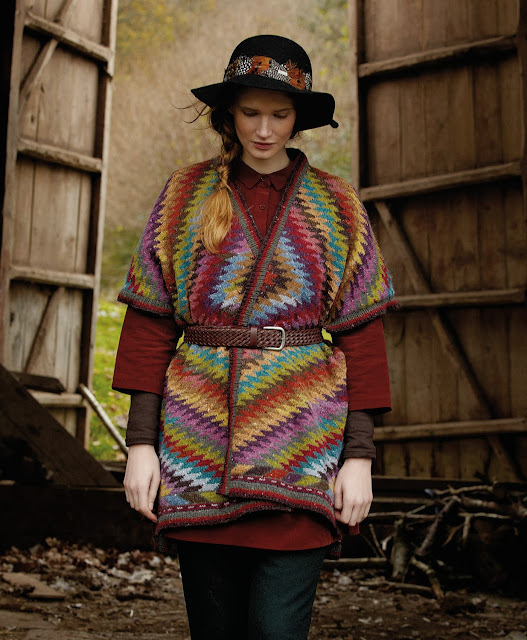 OF COURSE, it's by the wonderful Kaffe Fassett. 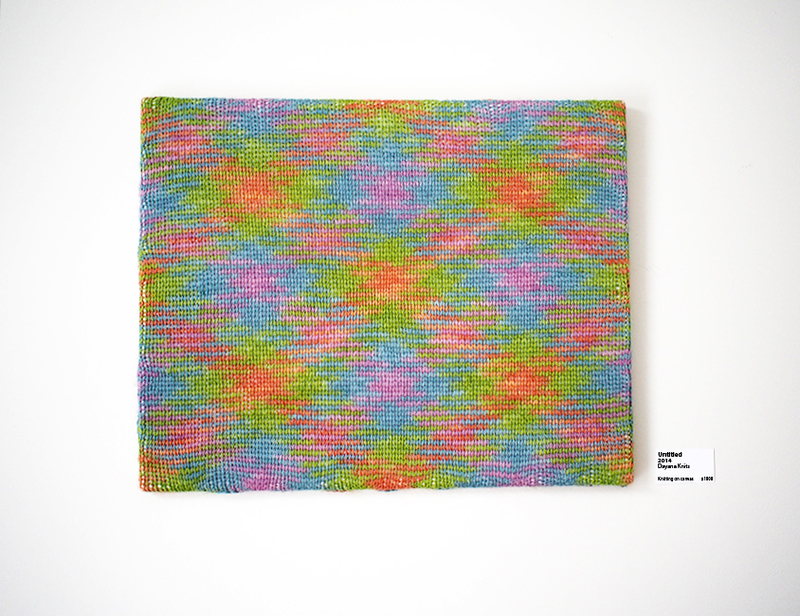 This is the Kilim Wrap, made with Rowan Felted Tweed DK. And here I am, drowning in my prize! ALL RIGHT, let's be serious now... 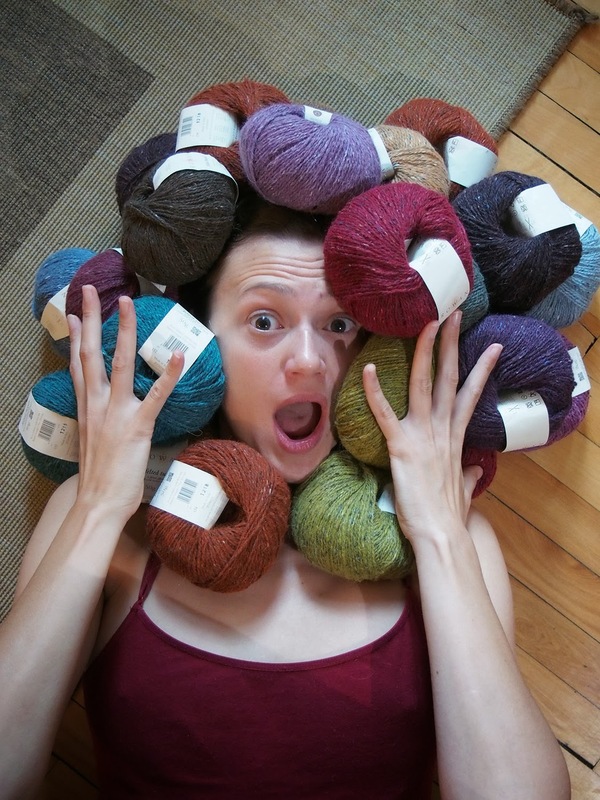 This serape-style wrap takes 24 balls in 16 shades of Felted Tweed DK, amazing right?! I can't tell you when I'll start this wrap... I definitely have some things to finish up first before I can tackle this leviathan. If you don't want to miss my progress, go ahead and follow this blog by e-mail or with Bloglovin'! Thank you so much for the link to your patterns! So lovely. That stitch pattern looks even better at small gauges. 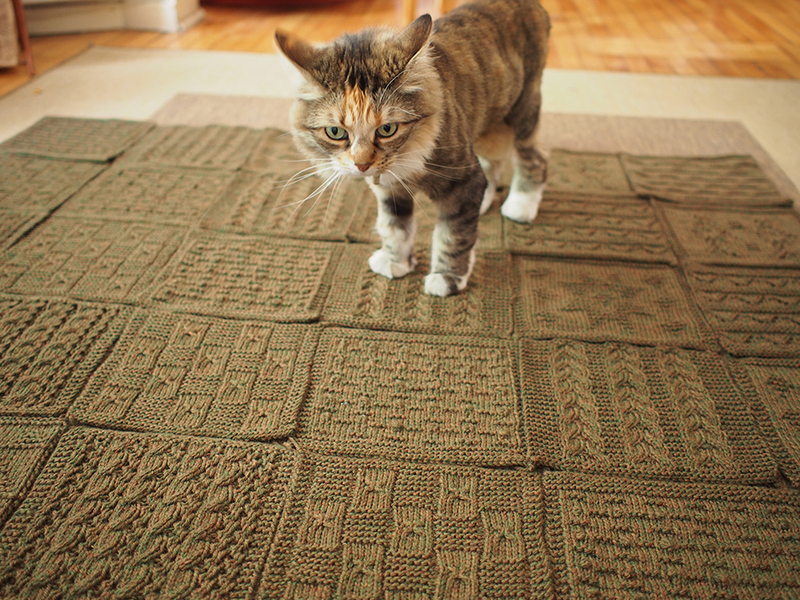 I really like this basket weave stitch pattern. It looks like it will hold up well and keep you warm. Congratulations! Thanks K.! I think I'm going to play some more with this pattern for something else... The old 80s book I found it in (though it's everywhere) said it was particularly good for outerwear! Congrats on winning the competition! Love this design. 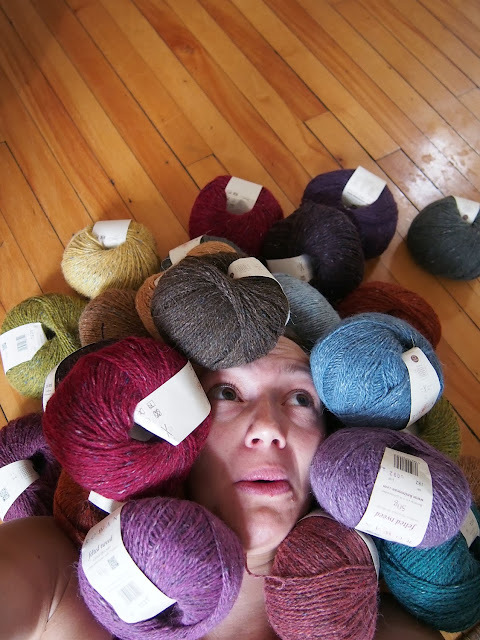 The funny story is that my husband caught me in the act one morning drowning in yarn with a camera... he was like, WHAT ARE YOU DOING? !